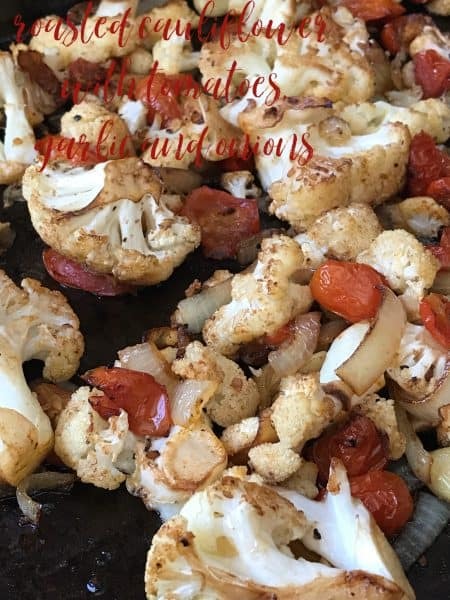 Roasted Cauliflower or roasting cauliflower is one of my favorite ways to eat/prepare cauliflower. Adding cherry or grape tomatoes, whole garlic cloves and sliced onions to the mix, and you’ll have a “Wow, why didn’t I think of this sooner,” moment. If you have never roasted vegetables before, you need to get in the habit asap. Why? Because all vegetables benefit from spending time in the oven. 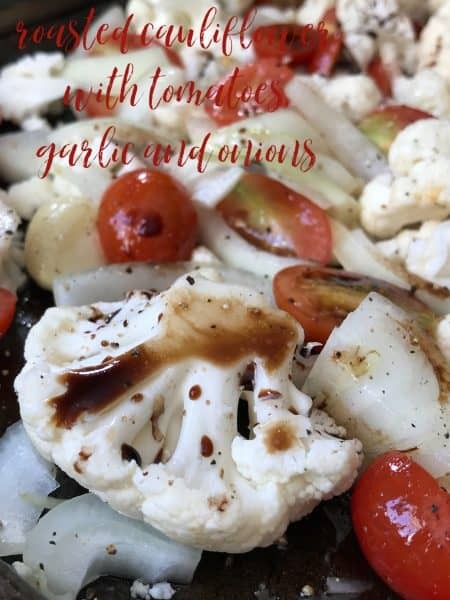 Roasted cauliflower with tomatoes, garlic and onions is a good recipe to start with. Well it’s that time of year again. Time for my computer to “act up”, “take a nose dive”or “went to hell.” This year my computer “went to hell” earlier than usual. I swear, every year around this time my computer acts up. Every single year! What’s even more frustrating about this whole situation, it always happens right around my birthday. It never fails. So guess what I get every year for my birthday?? Yep, you guessed it, I trip to Best Buy. Its not necessarily a bad thing that I have computer problems every March, April or May. I mean it’s not that bad to get a new computer for your birthday every couple of years or have your computer repaired but c’mon, a piece of jewelry would be nice. Another thing, why is it that every time you have computer problems, everyone treats you like you have a virus or something? They Avoid You Like the Plague! People have a tendency to treat you like you have the plague when your computer is on the fritz. Nobody wants computer woes but it’s not catchy for crying out loud. Case in point, I wasted a whole week dinking around with people I assumed would “help” but didn’t. Next time I’m going straight to Best Buy. No second guessing! Enough about me and my belly-aching! On to the recipe…. The best way to roast vegetables is on a large baking sheet that has sides. This will keep the vegetables from sliding off and it well keep the oil and balsamic vinegar where it needs to be. We like to use Nordic Ware heavy duty baking sheet. A delicious mixture of roasted vegetables. Serve roasted vegetables over jasmine rice, as a side dish or serve alone. Remove outer leaves and core from cauliflower. With a sharp knife slice cauliflower. 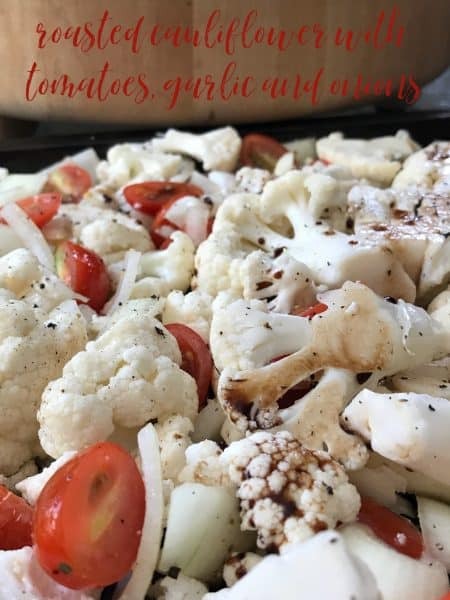 Place cauliflower on a baking sheet that has sides. Cut onion in half. Slice onions and toss with cauliflower on baking sheet. Peel garlic, leave whole. Toss with cauliflower and onions. Slice cherry or grape tomatoes in half. Toss with cauliflower, onions and garlic. Drizzle vegetables on baking sheet with vegetable oil. Toss well to coat vegetables. Drizzle vegetables with balsamic vinegar and season with salt and pepper. Toss well to coat. Bake at 400 degree for 20 to 30 minutes or until cauliflower is fork tender, tossing vegetables with wooden spoon every 5 minutes. Roasting times will vary greatly due to many factors such as freshness of vegetables, oven temperatures, etc. Serve roasted vegetables over rice or as a side dish. Looking for more vegetable recipes?? We have many to choose from. Vegetable Gratin, Vegetable Bundles and Cheesy Garlic Mashed Cauliflower.